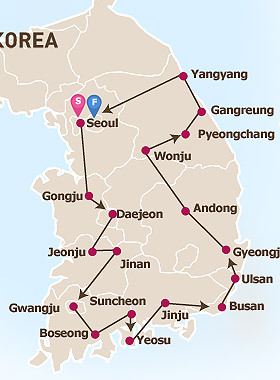 Budget South Korea Holidays travelling by Coach. Explore South Korea in 9 Days. Lunch & dinner will be served at local restaurant en route. Pick up from your hotel in Seoul by our driver and transfer to Lotte Seoul Hotel for group departure. Leave for Gongju, the ancient capital of Baekje Kingdom. You will visit Gongsanseong Fortress, Tomb of Muryeong King and Magoksa Temple where you will experience a tea ceremony with a Buddhist monk. Leave for Daejeon, one of the five major cities in Korea and check-in to your hotel after having had dinner at a local restaurant. Breakfast in the hotel, leave for Jeonju, home of Korean Culture and tradition. Visit Jeonju Hanok Village (Korean Traditional Houses). After enjoying a Jeonju Bibimbap lunch at a local restaurant, depart to Jinan and visit Tapsa Temple at Mount Maisan, leaving for Gwangju afterwards. Sightseeing of the day will be Green Tea Plantation in Boseong, Naganeupseong Folk Village, Suncheonman Bay Ecological Park wih its Reed Marshes, & Yongsan Observatory and Eco-Museum in Suncheon. Transfer to Yeosu. Transfer to Jinju and visit Jinjuseong Fortress. Transfer to Busan, the largest port city in Korea. Visit Nurimaru APEC House located at Dongbaekseom. Then visit Centum City Shopping Mall which has the largest department store in the world. Leave for Ulsan after hotel breakfast and upon arrival, visit Ulgi Park which is a seaside park situated on the east coast. Transfer to Gyeongju and visit Bulguksa Temple, Gyeongju National Museum, Anapji Pond and Tumuli Park. Transfer to your hotel having had dinner at a local restaurant. Leave for Andong and visit Hahoe Village upon arrival. After lunch at a local restaurant, transfer to Wonju, Visit Hanji Theme Park and experience the making of Hanji (traditional Korean paper). Transfer to Pyeongchang and check in to your hotel. Lunch will be served en route at a local restaurant. After breakfast, leave for Gangreung and visit Jumunjin Fish Market. And then, transfer to Yangyang for a short hike of Mount Seoraksan at Jujeongol, enjoying its natural beauty. After lunch at a local restaurant, return to Seoul, arriving early evening. US$ 1845 per person- based on 2 sharing a room and airport transfers.